The fourth largest island in the world is waiting for you. Join this 15 day cycling adventure that is unlike any other. Spend your days on quiet roads cycling through a landscape of natural swimming pools, unique rock formations, dramatic highland plans, and more. Take a break in the Ranomafana National Park to explore the lush rainforest complete with huge waterfalls and deep canyons. You’ll discover the countries many fruit orchards, paddy fields, Isalo National Park, fisherman villages, white sand beaches, and so much more. For culture, you’ll visit Ambositra, Madagascar’s arts and crafts capital. There are also stops or visits in small villages like Faratsiho, Antisirabe, Ambalavaro, the Horombe plateau, and more. This is a moderately challenging adventure with eight full days of cycling. The daily cycling average is 67 kilometres and you’ll have 100% vehicle support. Most of the time, you’ll enjoy the quiet back roads of the island, but there are times when you’ll be travelling on main roads – though Madasgar lacks heavy traffic even in the large towns you’ll visit. 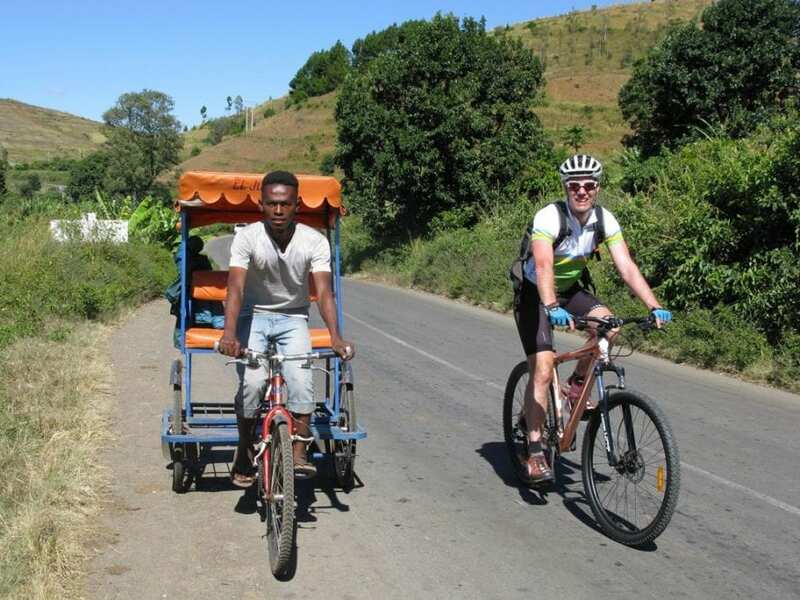 Enquire today to save your spot on this remarkable Madagascar cycling adventure. The food in Madagascar is generally of a good quality, particularly so by the coast where the seafood is excellent. A one-course lunch/dinner should cost £4-6 while a three-course lunch/dinner should cost £9-12 . Please allow approximately £220 for meals not included, plus a little more if you enjoy a drink with dinner! Malagasy lager is reasonably priced and easily available. Malagasy wine is also reasonably priced but is not to everyone’s taste. It is sometimes possible to get hold of French or South African wine. A delicacy in Madagascar is the various flavoured rum’s which are widely sold and very reasonably priced.Please note that if you eat neither fish nor meat, your food options will be rather limited (i.e. omelette, cheese, pasta, vegetables and rice) on this trip. Breakfasts are usually simple, eggs, a baguette, jam and coffee or tea, and sometimes fruit. You may wish to bring something to supplement your morning meal (e.g spread, peanut butter etc).